The Costa del Sol is a very popular holiday destination in the south of Spain. It’s made up of some lovely seaside towns with sandy beaches and clear, blue waters. Tourists often flock to this popular coast to enjoy sunny summer holidays. A summer holiday can be expensive, especially if you want to go and live the high life! While playing this slot game, you may even win enough to fund a holiday to the Costa del Sol with all of your Costa del Cash! Set at the beach, there’s a lot on this slot game that will get you into the holiday spirit. The reels and the logo are palm tree-inspired, which is a nice touch. There are only a few clouds in an otherwise bright blue sky! If you have ever played a Novomatic game before, you’ll quickly recognise a few of the details as being classic of this developer! This online video slot comes with the signature music, sound effects, gamble option and autoplay feature. 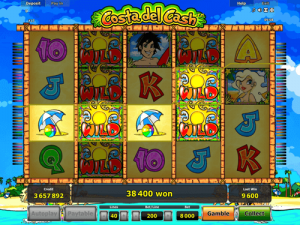 Costa Del Cash has 5 reels and a total of 50 paylines. You can play in free mode and you can play it for real money. Novomatic casinos offer real money play for their high-quality online slots and video slots. If you dream of a sunny holiday, relaxing on the beach, drinking cocktails, then try out this slot! Other similar slots from this world-famous online slot vendor are: Caribbean Holidays, Summer Queen, Samba de Janeiro, Polynesian Beauty – 2nd Chance Respin and Beach Holidays. You can win Free Spins in Costa del Cash but mostly you’ll be playing the normal game. This is played on 5 reels with 40 paylines. The 40 paylines are optional lines, and so you can select the number of paylines you like to play on. 1, 7, 10, 27 or all 40 – it’s your choice! Right next to the payline settings, you’ll find the settings to select your bet per line. Every time you spin the reels, your total bet will your bet per line multiplied by the paylines you have activated. On the paytable, the rules are displayed and the payouts are shown as well. Symbols 9 and 10 award the smallest wins in the game. Symbols Jack and Queen and King and Ace offer slightly bigger wins. The picture symbols in Costa del Cash are worth the big bucks and dish out the big payouts! These are: the fruity cocktail, the beach umbrella and beach ball, the jet ski, the blonde bikini sunbather and the surfer dude. The way the wins are awarded will depend on how the symbols land when the reels are stopped. This is where the paylines come in! One-way pays only are awarded and the lines pay left to right. 3 is the minimum number of matches that are required for a win. 4 matches and 5 matches award even higher payouts! The paylines only pay for matches that land consecutively, starting from reel 1. The hottest symbol on the reels of this video slot is the Wild symbol, which pictures the burning hot, Spanish sun! If there aren’t enough matches on a payline for a payout (or if there’s a gap in the payline), the Wild symbol can step in. Things get even hotter when you trigger the Costa del Cash bonus! In fact, you can actually see the temperature rising on the bonus thermometer! The Bonus symbol doesn’t answer to paylines – 3, 4 or 5 bonus symbols can land anywhere and award the corresponding payout and 10 free spins! When the Free Spins are awarded, there’s practically a heat wave. This is when you’ll get the super big wins. The Free Spins have all the same symbols as the ordinary spins and they are played on the same reels. However, unlike in the normal game, in the Free Spins, your wins can be multiplied. The multipliers go up to x10. If you do well in the Free Spins, you might even win enough to get yourself to the real Costa del Sol!